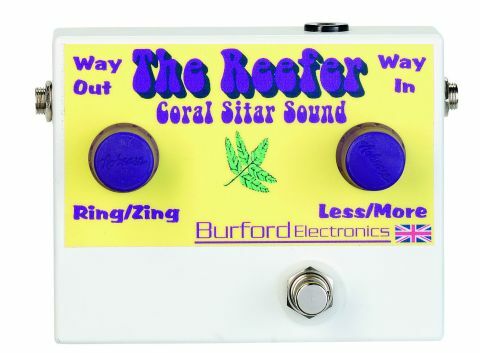 The Reefer is equally original, great fun and capable capable of surprisingly effective and authentic electric sitar sounds. It's also great value. Sounds. Clean boost option. Easily understood controls. Lack of an LED indicator. Alan Exley has been in the UK guitar-making/repair business for many years and also offers instrument accessories, plus a custom scratchplate service. As if this wasn't enough, he's the brains and brawn behind Burford Electronics pedals; hand-built stompboxes that go beyond the mainstream market models. The range includes some of the usual sonic suspects, most enhanced by a novel twist or two, while others explore aural avenues where few floor pedals have boldly gone before. Here we have his Reefer electric sitar simulator. Rather than reproduce the real thing, this aims to imitate the Coral Electric Sitar, which appeared in the psychedelic late-'60s and has featured on innumerable records ever since. Originals now command prodigious prices, while updated and improved interpretations don't come cheap either, so pedal power provides a much less expensive alternative and can be used with any instrument of choice - both points big bonuses for many players. The Reefer sports suitably garish graphics, complete with 'way out/way in' jack connections, plus purple pots intriguingly labelled ring/zing and less/ more. Circuitry is simpler visually, being bereft of any mini switches or LEDs, although lack of the latter could be seen as an inconvenient omission. As its title suggests the left pot does indeed go from 'ring' to 'zing': fully off keeps things clean, while clockwise rotation introduces increasing amounts of sitar-simulating sizzle. The other control matches its job description equally accurately, altering the output volume as required. As with any spice, a little goes a long way and here the amount of effect employed is very dependent on variables such as instrument tone, humbucker or single-coil pickups, neck or bridge position selections and attendant amplifier settings. Experimentation is therefore essential to return the best results, as too much spiky splat causes the sound to go sharp and messy. But the controls are responsive and intuitive, so solos can soon become decidedly Indian influenced, and with care it's possible to effect chords as well.